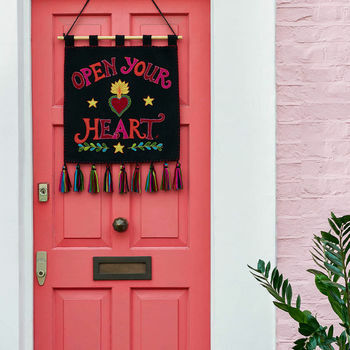 The Jan Constantine Open Your Heart Banner is appliquéd and intricately hand-embroidered with this wonderful message, stitched in multicoloured letters and motifs on black felt wool. Embellished with a flaming red heart, yellow stars and green foliage, it has 5 hanging loops across the top edge and is finished with 9 multicoloured tassels along the lower edge. It is lined on the back with contrast red cotton. As part of Jan’s Fiesta Collection, this beautiful work of art lifts the spirits and will be a conversation piece wherever it hangs. It is destined to become an heirloom of future. A simple wooden baton is included with each banner. This product is dispatched to you by Jan Constantine.